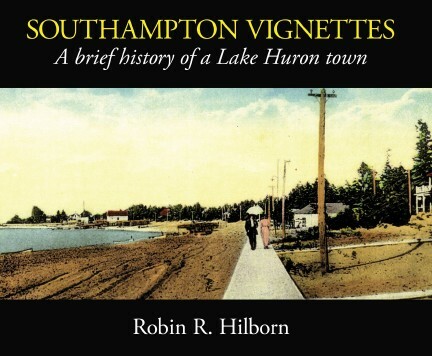 October 2015 -- After the first edition sold out in 2011 author Robin Hilborn received many requests to reprint his local history book, Southampton Vignettes. He has just released a second edition, updated with new chapters on Southampton history before 1850.  24 chapters cover 200 years of Southampton history, from fur traders in the 19th century to the 21st century restoration of the lightkeeper's cottage on Chantry Island.  140 photographs illustrate many aspects of town history, from the bustling river harbour and train station to the destruction caused by Hurricane Hazel, the bridges which tumbled into the Saugeen River and the great docks forming the Harbour of Refuge. "Southampton Vignettes is a wonderful addition to everyone's library". Nov. 21, 2015, 2:00 p.m. Please send me ___ copies of Southampton Vignettes ($25 each). Add $8 per order for shipping. I enclose a $_____ cheque to "Robin Hilborn".  Price in Canada is in Can$. For U.S. addresses, in US$.  We accept cheques and post office money orders. Sorry, no credit cards (so you don't have to reveal your card number).  No tax ... Family Helper Publishing is tax-exempt.